NBA LIVE 14 delivers fresh content and challenges on a daily basis to give you a new experience every time you pick up the controller. If You Like - Basketball. Become part of the action as you take part in the season as your favourite teams, brought to life on screen by the Xbox One’s power and the EA Sports Ignite Engine. Powered by EA SPORTS IGNITE on Xbox One, the all-in-one games and entertainment system from Microsoft, NBA LIVE 14 delivers the ultimate on court control, combining the art of basketball with the science of next generation technology. bounceTek, fueled by next-gen visual fidelity and up to 8x the processing power, unlocks a revolutionary new, physics-based dribbling system. bounceTek – The dribble is fundamental to basketball, but it’s also the unique signature of every NBA star. Whether it’s Rubio’s wrap around or Irving’s devastating hesitation dribble, creativity is at the core of every move. bounceTek unlocks the full potential of the dribble by releasing the ball to physics., allowing for truly organic control. With NBA LIVE 14, one-on-one matchups take on a whole new meaning and finally allow for creativity and self-expression. NBA LIVE 14 puts the control back in your hands. 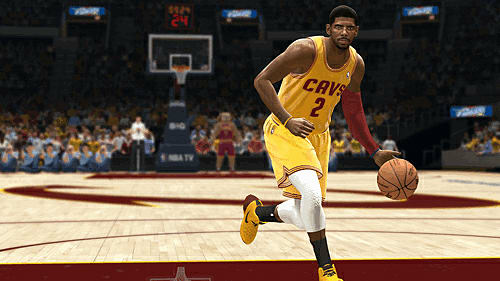 CourtQ (Court Quotient) – With 15x the memory, CourtQ is the brain of NBA LIVE 14. Over 70 unique statistics and tendencies power every single player on the court, utilizing the same data used by all 30 NBA teams. NBA players evolve throughout the season, and so does CourtQ, downloading updates from every NBA game within 1-hr of the final buzzer. If a breakout star gets hot in the NBA, he’ll be hot in NBA LIVE 14. LIVE World – With fresh content and challenges on a daily basis, NBA LIVE 14 delivers a new experience each and every time you pick up the controller. More info coming soon! Head-to-Head Seasons - NBA Live 14 tracks the results of each online game and places players in the appropriate league based on their skill level. Win enough games and you’ll be promoted to the next level of competition, struggle and face demotion to a lower tier. Jump into LIVE Season - Enjoy new content every day, powered by CourtQ and Synergy. Take on quick challenges based on each day’s most memorable NBA performances in BIG Moments. Whether you’re faced with scoring a last-minute buzzer-beater or swiping the ball three times in a quarter with a specific player, these bite-sized challenges provide a quick dose of NBA action. Replicate history or rewrite it in NBA Rewind as you take control of the league’s biggest stars and teams throughout the season with the actual team roster, player stats and tendencies. Attempt to match or surpass full-game objectives generated by Synergy and CourtQ that focus on several key performances from the actual contest. LIVE Ultimate Team - Experience the perfect combination of NBA LIVE 14 and fantasy basketball, as you build your Ultimate Team of the brightest modern NBA stars and all-time legends in LIVE Ultimate Team. EA SPORTS Hoops Network - Stay connected with friends and track their performances and success alongside other NBA LIVE gamers across the globe. Everything fans do in NBA LIVE 14 rewards them with XP, which will unlock new content and bonuses in LIVE Ultimate Team as players level-up.